When many people think about innovation within an organization, they associate the idea with the R&D department and figure that there are a group of folks in that part of the company whose job it is to innovate. This is unfortunate because every leader in the company has the opportunity to spearhead efforts for positive change. Innovation isn’t constrained to product offerings. It includes improvements big and small throughout the organization. Those that are successful in harnessing the collective wisdom make innovation an imperative for leaders, one upon which their performance is measured. 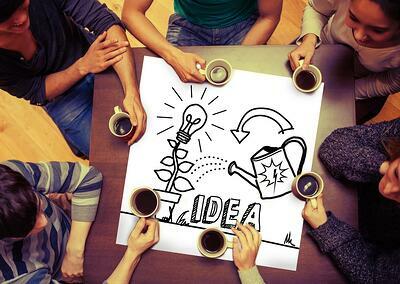 Most business leaders would agree that employee ideas for improvement are good things, but few recognize that they are actually valuable assets that are necessary for future success. If ideas are assets, they don’t just go into a suggestion box to wither and die. They are assessed, leveraged, and celebrated. Even ideas that are never implemented have value because they give you insight into how employees are thinking and what processes or problems are on their minds. People who are afraid to fail, or are afraid that unusual ideas will be ridiculed, simply aren’t capable of innovation. In a culture that stifles ideas, the safest course of action will always be to do what you’ve always done. Organizations that successfully crowdsource innovation create space for people to “fail forward.” They are willing to give unconventional ideas a shot once in a while. It probably goes without saying that internal crowdsourcing means involving everyone, but that’s easier said than done. Leaders need to ensure that each employee is invited to participate and that there are no departmental silos or hierarchy when it comes to sharing ideas. It is important to say that the people closest to the processes they perform are in the best position to innovate them. We mentioned before that static suggestion boxes are the worst. The alternative is to implement a software solution that serves as a collection, management, and measurement platform for innovation. Employees can submit a suggestion from anywhere at any time and they can follow it through the process as it is evaluated and potentially implemented. Even better, they can review the metrics over time and witness the impact. We get the attraction of holding a contest to see who can come up with the best idea, but that’s not the point of crowdsourcing innovation. There is no “best,” nor is there a reason to limit the number of opportunities for improvement that are implemented to a select few. Instead, innovation should be a collaborative process where good ideas can build on others and you can collect as many as there are. Innovation should also not be limited to a particular time frame. When inspiration strikes, grab onto it and take advantage. Of course, there are people in your organization who have valuable specialized knowledge that you should not ignore. However, it’s important to be on the lookout for people who say, “I’m the expert. You don’t know what you are talking about. I’ll decide what to do.” That can shut down the discussion and leave things exactly as they are. Instead, it helps to train experts to serve as moderators and teach them to ask as many questions as they answer. For most front-line employees, innovation is a matter of discretion. They can participate or not. The best way to get them to put in this extra effort is to provide positive feedback and recognize the people who are contributing to positive change. That’s how improvement snowballs in the most successful organizations. Crowdsourcing innovation is valuable, and it can even be fun. If you create the right environment, chances are your team will be delighted to take part and propel your organization toward it’s most important strategic goals.